‹ What’s one unit of play for an RPG? I’ve got time travel gaming on the brain, and haven’t yet found a time travel RPG that hits exactly the vibe I’m after. Epidiah Ravachol‘s Time & Temp is at the top of my shortlist to play, with the excellent Timeworks setting from Fate Worlds: Worlds in Shadow running a close second. But those both do specific things (nothing wrong with that! ), and I’m after something more open-ended. It may become more specific as I think about it more, but for now loosey-goosey is good. I want to pack my brain with interesting, RPG-oriented time travel stuff, and whenever I’m that mood the answer is usually GURPS. 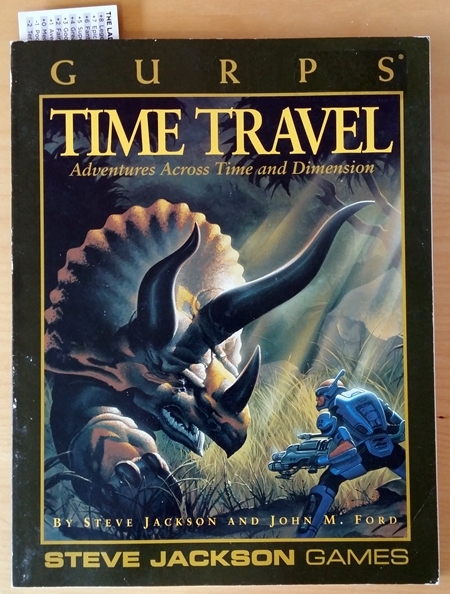 In this case, GURPS Time Travel, by Steve Jackson and John M. Ford. Like GURPS Warehouse 23 and GURPS Illuminati, which I’ve written about on Yore, Time Travel is a toolkit. It takes one huge enchilada of a topic and comes at it from several angles, teases out the best bits from each angle, and gives you the stuff you need to put it back together how you like. The book provides a default campaign setting, and it’s a good one: Timepiece agents vs. Stopwatch agents, each group trying to ensure the survival of their own timeline, with lots of clever details. For example: Time travel “windows” are always about 8 months apart, so sometimes you need to go back too far and wait for your moment; and whether history can be changed depends on whether an agent observes it, so there are delightfully perverse incentives to walk away from problems so you can take another run at them later on. In a (parallel) world . . .
One of those angles, dimensional travel/parallel worlds as an alternative to time travel, wasn’t even on my radar until I started looking into (and then bought) this book. It features many of the best bits of time travel — alternate worlds, ahistorical elements, fish out of water — without all the brain-burning paradoxes and temporal physics. There’s a whole setting in Time Travel, Infinite Worlds, which delves into dimensional travel, and the topic gets quite a bit of attention in the book. It also got blown out into a much bigger book (which apparently also reprints some of what’s in this one), GURPS Infinite Worlds. That one’s on the way, and I’m excited to read it. That’s just handy! It covers a host of common questions — the stuff everyone at the table will ask — while also rounding out some corners, establishing a solid baseline, and piquing the group’s interest. I’m not sure what I’ll do with it yet, although that Fate bookmark peeking out the top isn’t an accident. I think Fate would be a great fit for a time/dimension travel game, particularly since I can lean on what’s already in Timeworks. Whatever I do with it, Time Travel is a great starting point. It’s my favorite kind of GURPS book: the kind that fires my imagination, gives me new ideas to chew on, and provides the tools to implement them — all in a tidy package of reasonable length. It’s also dirt cheap, at least at the moment — I paid $6 for my copy, and it’s in fine shape. 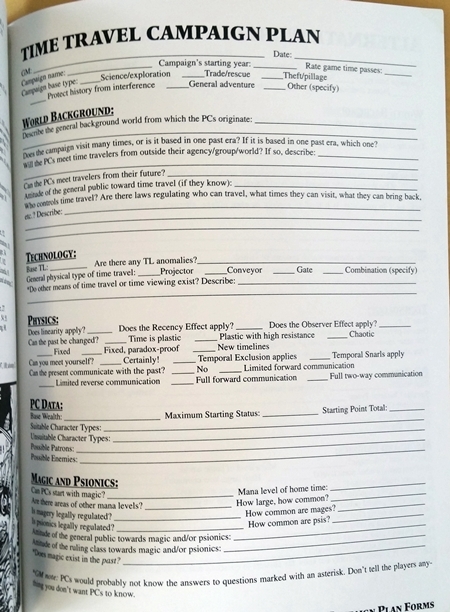 All of my favorite GURPS books are toolkits. Nope, leaving that one alone. Noooothing to see here.